Most iTunes users would like to encrypt their iTunes backup files for data security, which is also recommended by Apple. When we want to restore from iTunes backup, we need to enter the password to unlock it, which sometimes is a little troublesome especially when the password was forgotten. Here we collect 2 ways of how to decrypt an encrypted iPhone backup with/without password. iPhone backup is used as an example. iPad and iPod backup can be decrypted by these two methods as well. If you can remember your backup password, you can esily decrypt an iTunes backup in iTunes. Step 1. Open iTunes and connect your iOS device to the computer. Step 2. Uncheck "Encrypt iPhone backup" option as below. 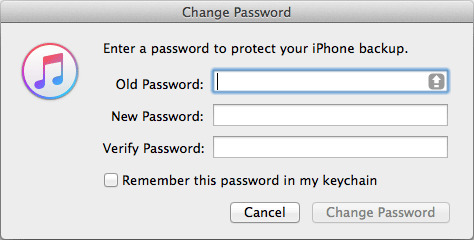 Then a sub-window will pop up to ask you to enter the password to unlock your iPhone backup. Actually, decrypting encrypted iTunes backup if you remember the password is nothing difficult at all. But if you forgot iPhone/iPad/iPod backup password, things are very tough. You have no other choices but to unlock the encrypted backup with an iTunes backup password unlocker. Tenorshare 4uKey - iTunes Backup I'm introducing here can exactly meet your needs. It is a tool proficient in recovering and removing iTunes backup password. It supports all versions of iTunes backup of iPhone, iPad and iPod including iPhone XS/XS Max/XR/X/8/7/6S/6, iPad Pro/Air (2), iPad mini 3, iPad 4, iPod touch, etc. Step 1. Run this tool after downloading and select "Retrieve iTunes backup password" from the main interface. Step 2. Then all iTunes backups on this computer will be listed. Double-click your wanted file to select it and click on the Next button. Step 3. There are 3 types of attacks featured: Brute-force Attack, Brute-force with Mask Attack and Dictionary Attack. Just select the most appropriate one to unlock iTunes backup file password. Step 4. When the attack method is settled, click "Start" to start to find password.Within a while, the password is displayed in a smaller window. Copy it. Then you can go back to iTunes and follow above tutorial to decrypt iPhone backup in iTunes. Or move on with this tool. OK. This is the end of the tutorial. After unlocking encrypted iTunes backup, you can restore data from iTunes backup freely. If you have problems on how to decrypt password-protected iTunes iPhone backup, please let us know.